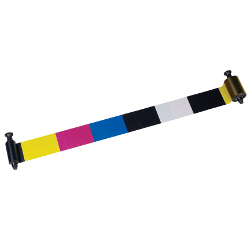 Genuine Evolis R3514 YMCKOK: Fullcolor ribbon for dual sided printing with two resin (K) black panel and clear(O) overlay panel. Prints 500 images per ribbon. Compatible with the following EvolisID card printers: Evolis Quantum 2 series.